I Don’t Want to See That! In exploring how my childhood vision restriction developed, I’ve wondered exactly what it was I didn’t want to see back then. As far as I know I never witnessed a horrible tragedy, like the musician Ray Charles did when his baby brother drowned in the bathtub. Ray blamed himself, then went blind less than a year later. For me, it just seemed like too much was coming at me at once, too much noise and rapidly moving chaotic images and other people’s strong feelings. It was like being in front of sensory fire hose. Vision is only one of our channels for taking in information from our environment. I was exposed, like everyone is, to unpleasant smells or discordant jarring noises. So why didn’t I restrict my sense of hearing, or dull my sense of smell? I don’t have an answer for that, and I often hear or smell something now others don’t. Maybe the main negative input coming toward me was visual, so that’s where I focused my shutting down. I’m remembering an article I read which said elderly men often lose their hearing in the exact range of their wife’s voice! There must be a better way than interfering with our finely-tuned senses. If you don’t want to hear something, you can plug your ears or leave the scene. 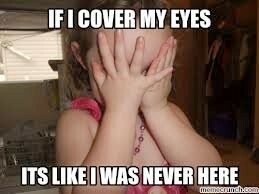 If you don’t want to see something, you can cover your eyes momentarily, and you can’t go through life that way. Children often aren’t able to leave when there’s something they don’t want to see. They are forced to look and not see too much, a very confusing message to the visual system. I remember my angry mother shouting “Look at me when I’m talking to you!” while disciplining me as a child, as I tried to look away. As I shut down my vision more, the teachers and my parents decided I needed glasses to solve the problem. Now I had another big critical adult face to look at and see I was doing something wrong, the eye doctor. I loved reading (books did not yell at me!) and since I was urged to always wear my glasses, I did. We now know using distance glasses for close work leads to increasing myopia, which is exactly what happened with me. As I got stronger and stronger glasses as a child, I was glad I could still see to read. I was starting to worry I’d grow up to be a blind adult, since my vision kept getting worse. I walked around the house with my eyes closed, memorizing where the furniture was, to get ready. The thicker my glasses became, the more they seemed like a barrier between me and the rest of the world. In a way I felt safer, if more cut off from others. I could feel the separation between us energetically when I looked at someone with my glasses on. Many years after childhood, I gradually improved my vision, reducing the strength of my glasses and eventually eliminating them. During this process I was regularly confronted with “too much coming at me” visually. I needed to learn how to cope with this, to say no and to give myself other choices, ones I didn’t have as a child. It’s a main focus for me today to make sure my visual environment is pleasing, and most of the faces I spend time with are friendly. I want my mind and body and visual system to get it on every level that I want to see, in as much detail as possible, that seeing well is a joy. How interesting Nancy, I did exactly the same!!!! 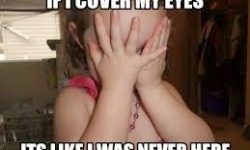 In one of my visits to the optician (very unpleasant man) I asked him what he thought about my eyes/vision since at every visit I had to increase my lenses. I must have been in my early teens then and he brutally said to me: your vision will get progressively worse and you might go blind! Ismat, your situation does sound a lot like mine. I’d say be grateful for the strengths you did develop, like being a top student and learning how to learn, and give your visual system the attention now it didn’t get as a child. For me it was a barometer of how overwhelmed and powerless I felt — my eyes were talking to me the only way they had, with blur. I didn’t need glasses and especially not stronger glasses, I needed to play more! Go for a walk outdoors with no agenda other than appreciating all you can see. And good for you for your awareness.